So about 2 weeks ago, Keith Mulligan, Jeff Z, and what was left of the Ride Bmx Magazine 'Range of Motion' video trip, Sergio Layos and Adam Baker stopped thru the trails. Terra, Max Trunz and crew, and some Panamoka guys also came through. Here are a few pics I captured with my point and shoot digi. 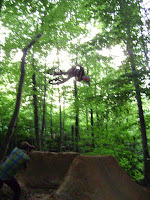 My pics do no justice to Sergio's upside down 3's on the most awkward jump at the trails...The Superman and 1 handed-No foot Can is Rich D'Alace, the Dying cat air is none other than ShitKat. 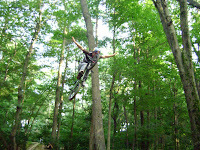 Back to Sergio...just wait till the video and magazine come out...More BMX action to come. "Hi there, I observe that your revealed content material is somewhat understanding because it talks about plenty of fascinating data. In Any Event, was questioning whether you'd want to interchange net hyperlinks with my website, as I'm searching to determine contacts to additional amplify and gain floor for my web portal. I do not mind you laying my net inbound links on the primary web page, just approving this hyperlinks on this specific net web page is more than sufficient. Anyway, would you be type enough message me back again at my web page if you might be keen in swapping inbound links, I would genuinely value that. Thanks a great deal and I hope to hear from you shortly! "